Click Here to see this group website for more details like stateroom types (with pictures, etc. Also the link tells of our policy. When you join this group, Please be aware of Carnival Legal Notice Here. You agree to their legal notice policy when you join this group. Warning: Price might change for 2020 Cruise. This is just an estimate. This is for all Deaf Schools / Other Schools for Deaf Students. It is sponsored by the Deaf hosts who went to Florida School for the Deaf. Deaf Performers will be provided if there is at least 500 Guests who signed up. If you do not have a phone number, type 000-0000 and type a note on the bottom of this page why. What is the name of the School that you are / were you associated with? What Year did you graduate from your high school? How are you associated to Deaf School / Other School for Deaf Students? If other guests are not associated to Florida School for the Deaf, click others and put in there. For example, Friend, Parent, Child, etc. What Year did third guest graduate from Florida School for the Deaf (If it applies)? If you did not graduated from FSD, but you have attended FSD, input the last year you attended. Also, if you were teacher, dorm counselor, etc. input what last year you were working at FSD. *Inside Stateroom for 2 Guests at $844.49 Per Guest for a total of $1688.98. *Oceanview Stateroom 2 Guests at $994.49 Per Guest for a total of $1988.98. *Balcony Stateroom 2 Guests at $*Oceanview Stateroom 2 Guests at $994.49 Per Guest for a total of $1,988.98. Per Guest for a total of $2228.98. *Suite Stateroom for 2 Guests at $1,384.49 Per Guest for a total of $2768.98. *Different Stateroom Type not listed above. Please ask us for a quote. I want 3 or 4 Guests in same stateroom. I know Price for third and fourth guests are usually cheaper than first and Second Guest. i know that we won't know the exact price until it is booked at that time when the schedule is available. Please be aware of Carnival Cancellation Policy Here.You agree to their cancellation policy when you choose which stateroom you want. We do not guarantee you will get the stateroom you want as it depends what is available at that time of reservation and we will let you know. *The price mentioned for staterooms are the lowest category of the stateroom usually in lower deck and in aft (back) or fwd (forward) of the ship. If you want better staterooms that are in midship and in higher decks, it would cost somewhat more. Keep that in mind when we tell you exact cost later when we are able to reserve the stateroom. Also there are different categories for each stateroom which prices can be different. Priority will be given to who pays deposit first if they want specific category type of stateroom. 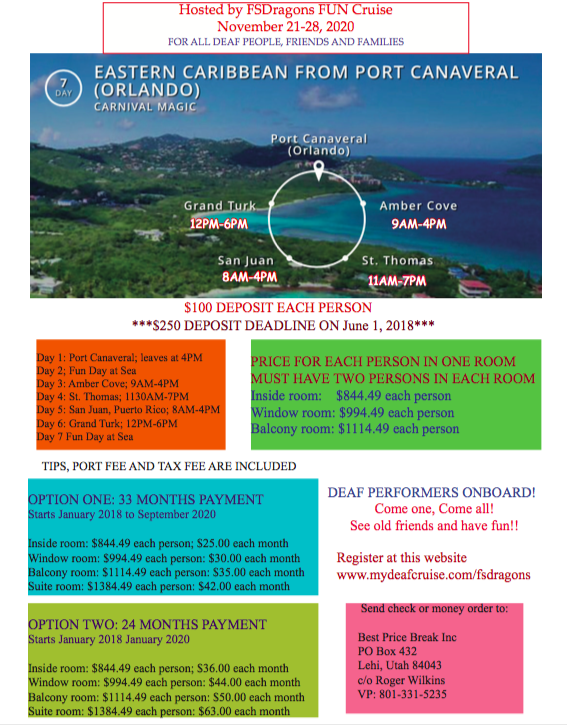 There is 10 dollars process fee for stateroom deposit cancellation with Best Price Break, Inc.
Once you submit this form, you will get the address where you can send the money to. Each roommate can send separate deposit if desired. I want to pay one installment later. I want to pay a few installments later. I want to pay monthly and will choose below. No, I want to pay in full rate now (This will override Deposit Due today). We only accept Checks, Money Order or Cashier Checks at this time. If your check bounce, there is a $20 dollars fee. If you decide to cancel, there is $10 processing fee with travel agency. When we have a new schedule for 2020 Cruise which we hope to know sometimes in 2018 and book the group, then we can accept Credit Card / Debit Cards then that will be paid directly to the cruise line. When you submit this order below, you will be taken to a page where you will know where to send the money to. Thank you. Questions or Comments? Type Below.